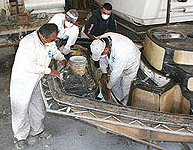 Our staff has many years of experience in building and repairing fiberglass boats, rudders, and related products. FinCo actually began as a boat-repair shop in 1990, then expanded its services to include the construction or renovation of fiberglass vessels ranging up to 60 feet in length. For more information about our maritime services, please call (714) 973-2878 or contact us at our offices in Santa Ana, California. 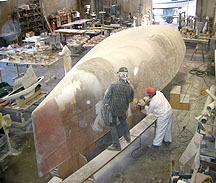 Applying fiberglass to a boat mold. 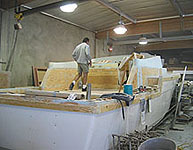 Building a sport fishing vessel.